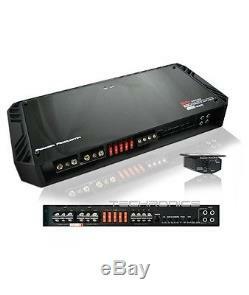 POWER ACOUSTIK BAMF5500/1D MONO BLOCK CLASS D 1 CHANNEL CAR STEREO AMPLIFIER. PowerAcoustik BAMF5500/1D 5500W Monoblock Class D Car Audio Amplifier. 4 ohms: 1700 watts x 1 chan. 2 ohms: 2300 watts x 1 chan. 1 ohm: 3200 watts x 1 chan. Max power output: 5500 watts x 1 chan. Fully regulated PWM power supply. Wired remote bass level control included. Adjustable Tuned Bass EQ (0-18 dB Bass Boost). Full selectable crossover HI, Full, Low. Full selectable crossover (HI, Full, Low). Die-cast aluminum heat sink designed for massive heat dissipation from three sides of the amplifier. Heavy duty aluminum alloy heatsink or High-density split-dome convection heat sink for extreme heat dissipation. Variable low-pass filter (40-200 Hz, 12 dB/octave). Variable subsonic filter (20-50 Hz). Signal to Noise Ratio: 100 dB. Dimensions: 16-7/8" L x 8-1/4" W x 2-1/8. 1/0-gauge power and ground wiring is required for installation. Can not sell KICKER products to the European Union. APO/FPO, Virgin Islands, Guam and All Other U. The item must be in BRAND NEW Condition. Screws, bass knobs, plastic coverings, protective films, etc. The item "POWER ACOUSTIK BAMF5500/1D 5500 WATTS MONO BLOCK CLASS D CAR STEREO AMPLIFIER" is in sale since Wednesday, October 14, 2015. This item is in the category "Consumer Electronics\Vehicle Electronics & GPS\Car Audio\Car Amplifiers". The seller is "techronics-store" and is located in Gardena, California. This item can be shipped worldwide.